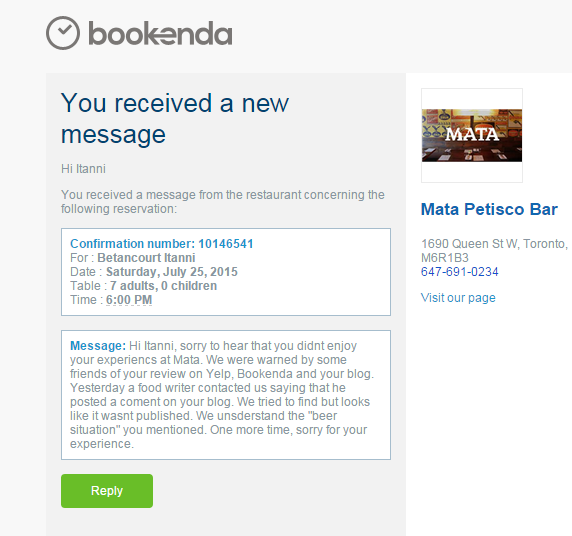 I went to Mata Petisco Bar tonight with 5 friends for Summerlicious, and it was such a disappointing experience. We were seated by the window and we actually really liked the space and the vibe of the restaurant. It was a beautiful evening, so getting a nice breeze was appreciated. Soon after arriving our waitress took our drink orders. I wanted a beer, and my male friend next to me wanted a cocktail. I had to tell her 3 times what beer I wanted and even had to point it out to her on the menu because she did not seem to be able to compute what I was telling her. The friend in front of me asked about the beer special (not really a special but rather the rotating tap) and our waitress explained that the beer on rotation was very hoppy, and hoppier than the IPA on their menu. My friend loves hoppy beers so he chose the rotating beer. About 5 minutes later, a beer was placed in front of the friend next to me and another in front of the friend in front of me, and both beers looked exactly the same to me. So I grabbed my beer from my friend (I hate when wait staff assumes that being female means that the dude orders beers and the chick orders cocktails) and the waitress seemed confused as to why I grabbed my friend’s beer. Sigh. Then she told the friend in front of me how she had made a mistake and the beer on rotation was in fact not hoppier so she decided to change his order to the beer on the regular menu. What?! My friend was too nice to say anything, but come on! You don’t just change a customers order without confirming with them first! She should have come out and told him about her mistake and then asked if he would be okay with the beer from the regular menu or if he still wanted to try the beer they had on rotation. But no, she took it upon herself to make the decision. On her defense, she made a note of telling us that she was new. The portions were TINY! And the food was bland, and uninspired. I had the cheese balls that were a total letdown. They were doughy, bland and with little texture contrast. I did ask the waitress if there was a sauce or something I could dip them in, and she suggested some cheese – seconds later a small saucer with cream cheese was brought out. The cheese balls did taste better with the cream cheese, but still not great. But it was a nice gesture. For the main I had the poutine and again, it was bland and boring – and I love cassava! The way I made the dish edible was by dousing in hot sauce and adding salt. For dessert I had the cheesecake and it tasted more like a custard and though a super tiny portion, I was only able to eat two small bites and left the rest behind – the dessert just tasted wrong! In terms of my friends, they spent a lot of the night trying to make feel less guilty about my dinner choice. We all agreed that the food was mediocre, bland, the portions ridiculously tiny – even for Summerlicious, and definitely not worth $25 plus the automatic 18% that they charged us! The consensus was: NEVER COME HERE AGAIN! And then we made the trek to Grand Electric for some tacos since we were still starving! I guess I should update my review because the restaurant has “apologized.” I don’t really see their message as positive, but maybe I am reading into it. So I will give them the benefit of the doubt and take it as positive and kind gesture. Hi Itanni, sorry to hear that you didnt enjoy your experiencs at Mata. We were warned by some friends of your review on Yelp, Bookenda and your blog. Yesterday a food writer contacted us saying that he posted a coment on your blog. We tried to find but looks like it wasnt published. We unsderstand the “beer situation” you mentioned. One more time, sorry for your experience. Warned? Yes, I reviewed “my experience.” Unfortunately I did not have a good experience, and I shared my perspective. That said, these review sites will show you the statistics on my reviews and tha I give very few negative reviews. I do not attack restaurants – only share my personal experience – which is the point. As for the “food writer” that messaged me – well, I don’t address messages that attack me personally. I have NEVER attacked another person. These responses reinforce my experience. I went to Mata for summerlicious as well. I also had the cheese balls and they were terrible… I am from Brazil and I have never had fried cheese balls, I don’t think you are supposed to deep fry them, that’s why they were terrible, plus I am pretty sure they are store bought. Everything else as from was just bland.